Dusit Thai is located on Main Street in Newport. 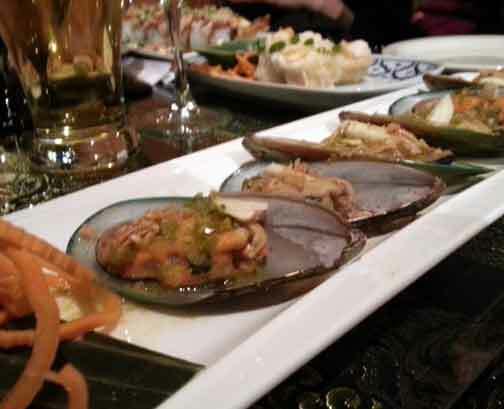 This authentic, Thai restaurant is a wonderful stop along your NEK culinary journey. We personally love the food here. First, it is the only sushi restaurant in Newport (a few places do sushi once a week, or have special events). And Second – I love the rice dishes. Now, I am a northern girl. I have little to no tolerance for spicy food. My husband on the other hand loves that there are so many options here that have a kick. As I stay away from the spicier dishes, I was very surprised when we first started coming here at how many non-spicy dishes there were. The last time we ate here we enjoyed a spread of Sushi, a number of appetizers, and I ordered my favorite dish – Fried Rice with Scallops. All of the entrées are listed on the menu by category (fried rice, stir fry, etc.) and then you add your choice of meat. The fried rice with scallops consists of perfectly cooked scallops, egg, onion, cilantro, and veggies. 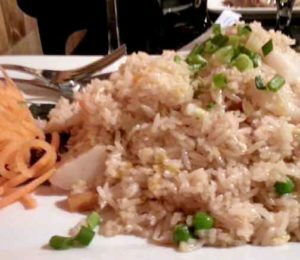 I was originally surprised at how light the dish was – for anyone not familiar with Thai food, or fresh cooked Asian Cuisine, it is nothing like the fried rice you get from an American Chinese Restaurant. And the dish is full of flavor. Our favorite sushi roll is the Super Crunchy roll – consisting of shrimp tempura, crunch (I think this is tempura crumbs), a mayo and eel sauce. 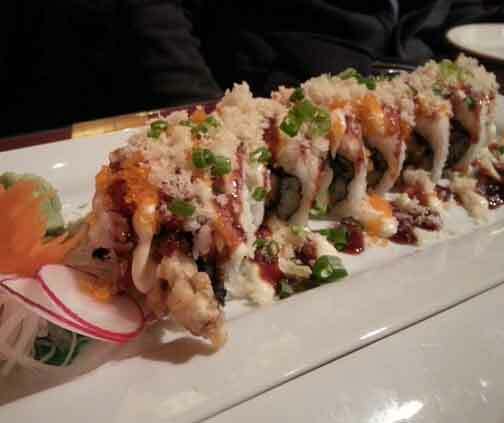 We also really like their Shrimp Tempura Roll. The sushi is fresh, always beautifully presented, and there is a large selection of rolls, individual pieces, and combos to choose from. Often a dinner at Dusit Thai consists of lots of small orders. We love their appetizer list. The fried spring rolls are incredible. 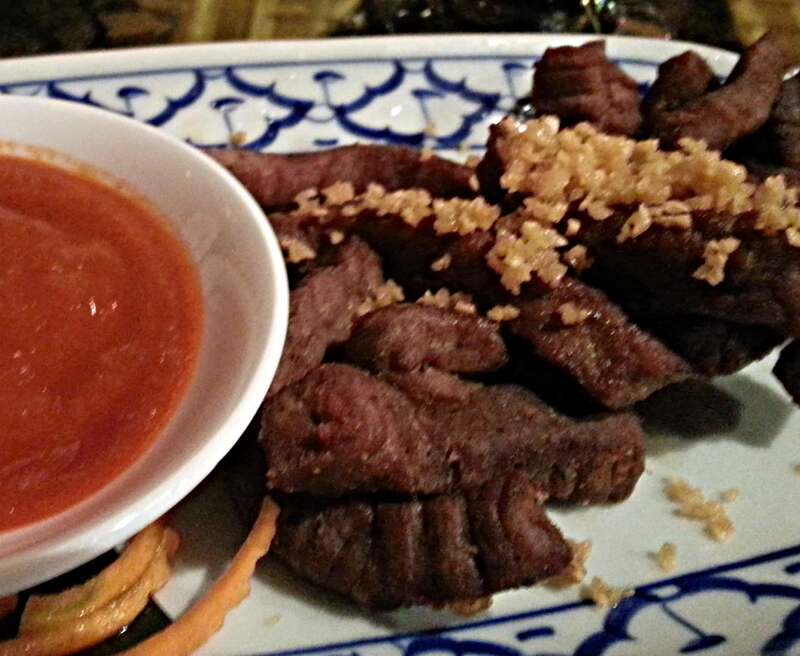 Another favorite of ours is the Thai Beef Jerky – flavorful sun-dried beef, fried and served with a delicious house made Asian bbq sauce. Another frequent dish that graces our table is the “Sauna Muscles”. This dish looks and smells incredible. I have tried it once – I am warning you, it is VERY Spicy. I gave it a shot, and thought it tasted amazing, until I swallowed and the slow building heat took over my mouth. Eat with caution. But if you like heat and great flavors, add this dish to your list. A few things to be aware of when eating at Dusit Thai – don’t be in a hurry. There is a very small staff which can make for a slow meal, especially if the place is more than half full. If you are okay with a leisurely meal, then you will enjoy the experience. But if you have somewhere to be or are a person that is looking for quick service, you may want to save this restaurant for a different day. There is plenty of seating in this restaurant, though many of the tables are small – this can be a challenge when you like to try many dishes, like we do. And the beer and wine selection is small and consists of the most basic options. Dusit Thai is on Main Street, so parking street side can be tricky. Luckily, Newport’s Main Street has a number of free parking lots (there is one at each end of the main drag, and a few behind some of the block buildings). In the summer, this short walk can be really nice, and allows you to take a look at a few of the shops, or stroll on the lakeside boardwalk. Like most restaurants in the Northeast Kingdom, Dusit Thai has its quirks, but overall if you are looking for outstanding, authentic cuisine, great sushi, and a relaxing atmosphere give this restaurant in Newport a try.